This article will review the key properties of the Fund Summary Part in NetCommunity for Foundations. The Fund Summary part provides an overview of the funds the user is authorized to view from GrantedGE or Financial Edge. 1. Fund List Source - This allows you to select whether to retrieve the list of available funds from The Raiser’s Edge or GrantedGE. The Raiser’s Edge retrieves all funds with which the user has a relationship (see How to Link to a User to a Fund in NetCommunity for Foundations). GrantedGE retrieves only funds for which the user is an advisor. 2. Disable All Funds Option - Select this checkbox to turn off the “All Funds” selection for users with access to more than one fund. This limits users to one fund at a time, and they cannot view a summary of all their funds. the user. This option only affects users with multiple funds and can only be used when the Disable All Funds Option is not checked. 4. 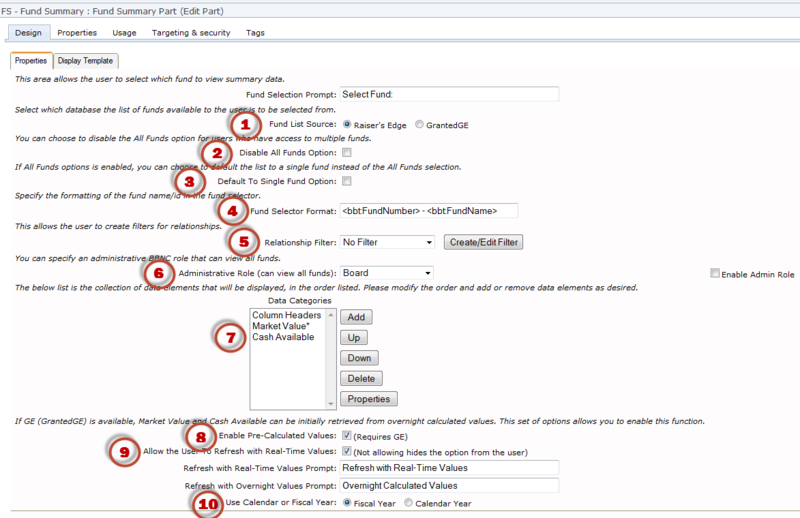 Fund Selector Format - This will set how you want the fund to display while the user is selecting it from the part. This is configured by using a set of tags that will display certain information from the Fund record in either/or the Raiser's Edge or GrantedGE. Refer to page 6 in the NetCommunity for Foundations Guide for a list of Fund Selector tags. 5. Relationship Filter - Select an existing relationship to filter the funds a user views. To create or edit a filter, click Create/Edit Filter. For information about how to create and edit filters, see Relationship Filters on pages 116-118 in the NetCommunity for Foundations Guide. 6. Administrative Role - You can select a NetCommunity role that allows any user in that role to view ANY/ALL Funds in the Fund Summary Part. To enable you need to select a role and click the box "Enable Admin Role." If you access this part as a user with this Administrative Role, it may affect the performance of the part due to the amount of data that is being accessed. 7. Data Categories - This list of data rows appears for users on the website. With the buttons beside the list, you can add, edit, and sort rows. Please refer to the Data Category Editor section on pages 12-13 in the NetCommunity for Foundations Guide for a detailed description of available Category Types and how they can be configured. for the Cash Available and Market Value of the selected funds. This is enabled only if you use GrantedGE. The values are calculated overnight in a GrantedGE batch process, which is scheduled in the GrantedGE configuration. These values can speed up the initial load of fund summary data for any fund. 9. Allow User to Refresh with Real-Time Values Prompt - If you use pre-calculated values for Cash Available and Market Values, then this option allows the user to refresh the Fund Summary with real-time values from The Financial Edge. 10. Use Calendar or Fiscal Year - If you select Fiscal Year, the information will be pulled based upon the Fiscal Years that are set within FE.